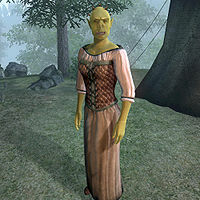 Batul gra-Sharob is an Orc smith and one of the few survivors living in the refugee camp outside Kvatch. During her hasty escape, she managed to save some of her equipment and has set up a small smithy near her tent in the camp. She sells a limited amount of lower quality weapons and offers repair services. Judging from her mastery in Mercantile, she was a major weaponry merchant in the now destroyed town, but it also means she pushes very hard bargains. Like the other survivors she spends all her time strolling around the camp in a state of disbelief, without ever eating. At 1am she crawls into her tent for five hours of restless sleep. She offers her repair services 24 hours a day but will only barter with you while she is awake. She wears a set of average, middle-class clothing including a pair of light brown linens, a quilted doublet, and a pair of thick cowhide shoes. She only carries a small amount of gold. Inside her tent is a locked chest full of clutter. Upon meeting her, she will angrily remark: "I don't have much. I lost everything." When asked about Kvatch it becomes apparent that she only remembers fragments of the attack: "I don't like to talk about it. I don't remember much. I woke to screaming and fire. I ran. I was lucky. I survived. My friends weren't so lucky." Once you've closed the Kvatch oblivion gate she will be relieved: "You closed the gate. That's the first good news in a long time." This page was last modified on 9 May 2017, at 03:36.